The short story of Baucis and Philemon provides a neat look at some of the values of the ancient Greek people. Here is the story, some discussion topics, an activity, and some additional layers that you can incorporate. Near a swampy lake in Phyrgia there is a low wall enclosing two trees–a linden and an oak. Long long ago Zeus visited this land with his son, Hermes, the messenger god. The two gods traveled through the land, disguised as ordinary travelers, knocking on doors and asking for shelter and food. They were turned away at door after door until they reached the humble shack of Baucis, a kind old woman, and Philemon, her husband, humble farmers, who welcomed them in. Baucis and Philemon had married young and worked and raised their family together and grown old, still in love and happy, though poor. With the two visitors seated a their humble table, Baucis kindled a fire and Philemon went to the garden to gather herbs for the stew pot. He flung in the rind of bacon and added water to the pot, stirring in the vegetables. All the while Baucis and Philemon cheerfully entertained their guests with conversation. When the meal was prepared and spread on the table. They began to eat. The old couple noticed with astonishment that their wine, no matter how much was poured, never ran out. 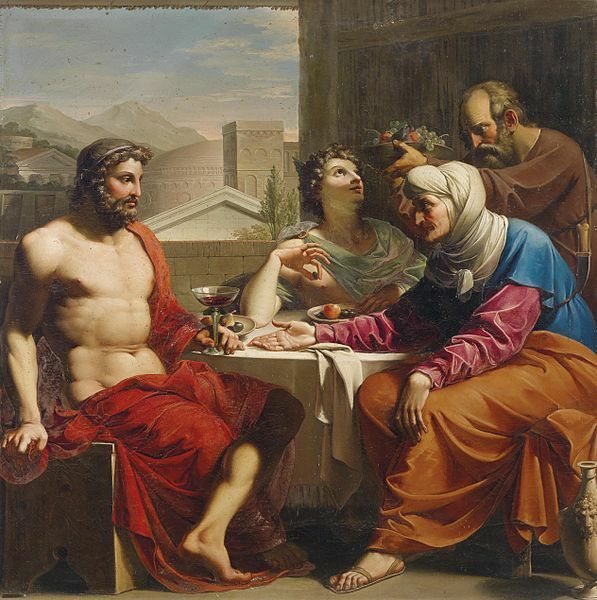 This is a painting of Baucis and Philemon entertaining Hermes and Zeus. It was painted sometime around 1800, give or take a few decades by Andrea Appiani or one of his friends. With humble surprise and some fear, the two recognized that their visitors were gods. They fell on their faces and begged pardon for the humble entertainment they had provided. The scrambled to add their lone goose to the meal, but the goose could not be caught. Zeus raised them to their feet and declared that though the ungrateful cruel village would be destroyed, Baucis and Philemon would be preserved. Zeus and Hermes took the couple to the top of a nearby hill and they all watched as a lake rose up and covered the whole of the village except for a little island upon which stood the small cottage of Baucis and Philemon. The cottage transformed into a beautiful columned temple before their eyes. Then Zeus asked the couple what they would ask of him. They consulted together, then Philemon begged that they might be made priests of the temple and when their time came to die they might leave this earth at the same time so as not to be parted in sorrow. Zeus granted their desire. For many more years the couple were priests of the small pretty temple and blessed all travelers who came their way with rest and food and safety on their travels. One day as they stood bent and stooped in the yard in front of the temple they saw one another changing into trees before their eyes. They understand that the time had come for them to leave the earth. Baucis changed into a beautiful linden and Philemon into a mighty oak. They stand there today, branches intertwining to remind all of their love and kindness. Talk about the story with your kids. Ask them what they like and do not like about the story. What do you think the moral of the story is? Does it tell us about any character traits that the Greeks valued? Do we still value those same traits today? Finally, ask your kids the question – If you could choose between being very good and kind or very wealthy and successful, which would you want to be? Print these Baucis and Philemon puppets figures onto card stock, color the pictures, cut out the circles, and attach craft sticks to the back. Then have your kids tell the story back to you as well as they can remember. They can each take a turn telling the story in their own way. Look up the details about linden and oak trees. How old do they get? What do their leaves and bark look like. How tall do they grow? The Greek Poet Ovid wrote the story of Baucis and Philemon in his Metamorphosis, VIII. Learn more about Ovid. Jonathan Swift wrote a parody of the Baucus and Philemon story in a poem called On the Ever-Lamented Loss of the Two Yew Trees In the Parish of Chilthorne, Somerset. The idea that the gods, or angels, might be travelers in disguise and therefore you should give hospitality to strangers, is not just a Greek one. Does your religious or cultural tradition contain stories or ideas about this? What does a Greek temple look like? Learn more about the architecture of these structures and draw a picture of what you think the temple of Baucis and Philemon might have looked like. Our unit on ancient Greece, Unit 1-4, would be a neat accompaniment to this story. You’ll learn more about the Greek civilization, their people, and what they valued. There are lots of hands-on activities meant to be done as a family in your homeschool. Our curriculum guide is a great place to learn all about Layers of Learning and how we approach homeschooling. You can also visit our history page for lots more ideas to help your family dig in to history. Click on the tabs at the top of the history page to go see explorations and printables for all of the other school subjects too. Check out some History Explorations right here.